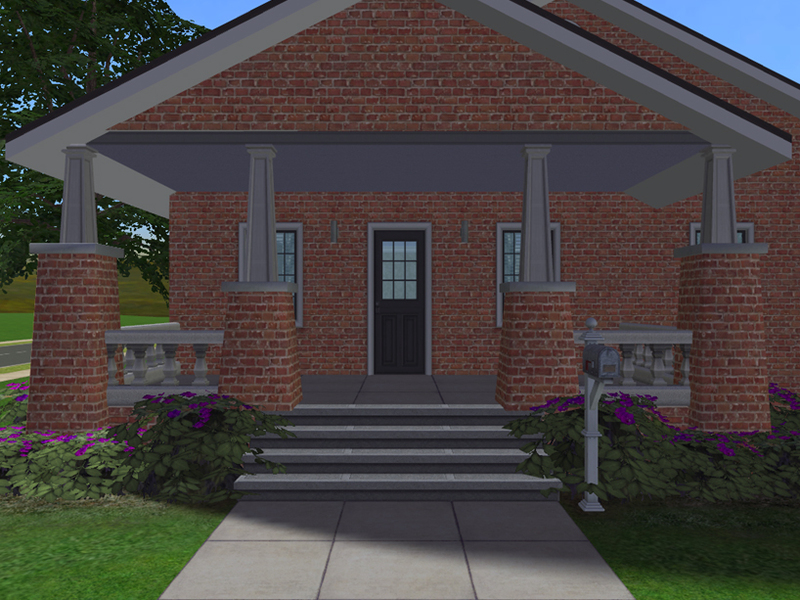 MTS member sara*rose uses the Maxis "Near The Floora" half wall to create Craftsman columns in quite a few of her lots. While I think this is an awesome use of that half wall, I didn't like the fact that there are only 3 color choices AND that you always have to have a half wall between the posts. So, I liberated those posts. 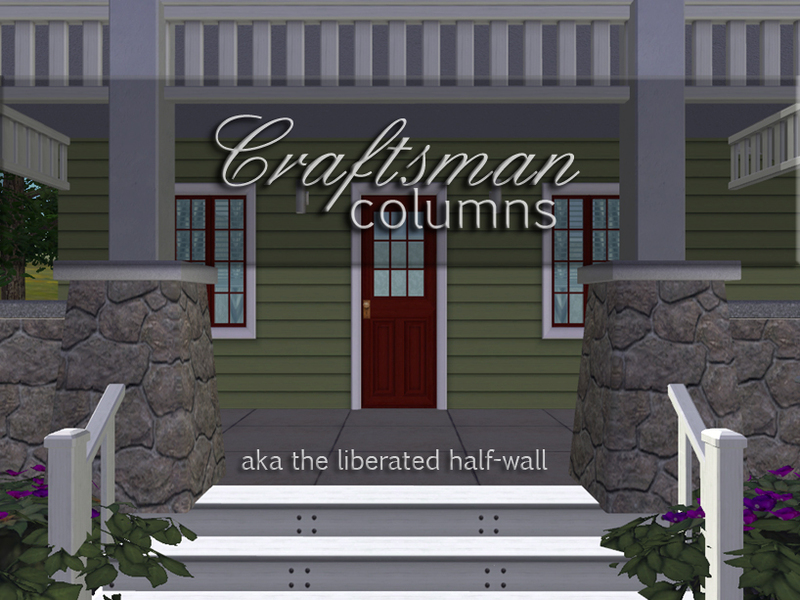 Now you can use them with any half wall or fence that you want to - plop another column on top of mine and... Craftsman Columns made the way YOU want them! 4 columns - 2 ground level columns and 2 foundation level columns. NOTE: Foundation level does not mean that they are floating in the air at foundation level. 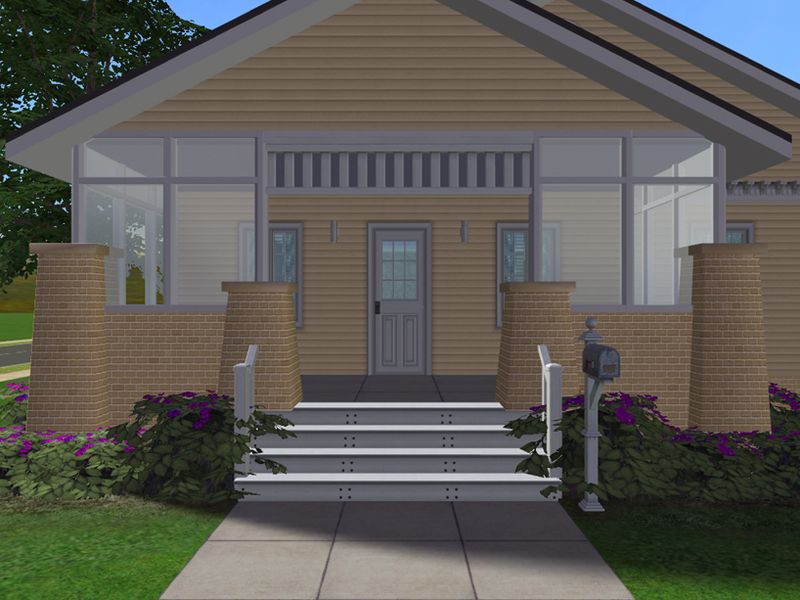 It means that they will be the same height as the ground level columns when placed on a foundation. 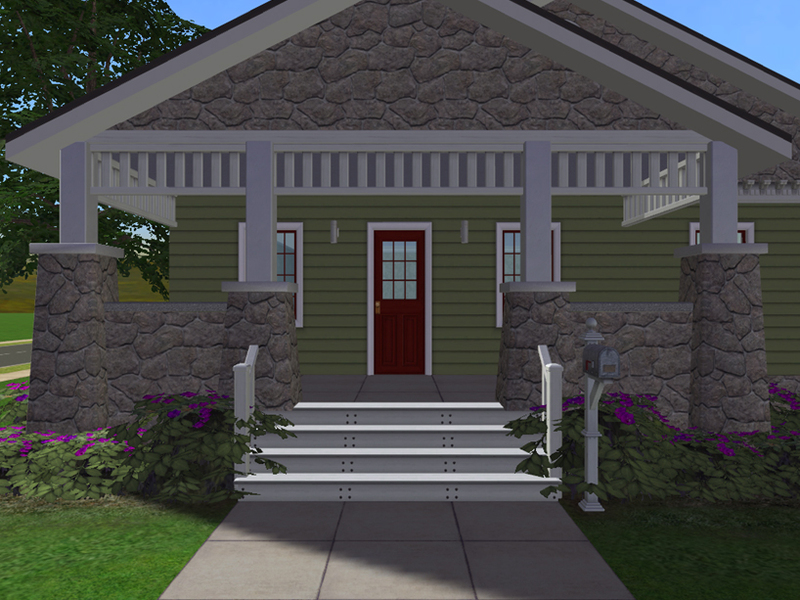 This way you can mix and match the column heights and they will match up when you use a foundation. 30 recolors - all textures were extracted from the game files and a few of them aren't actually used in game, except the top part. 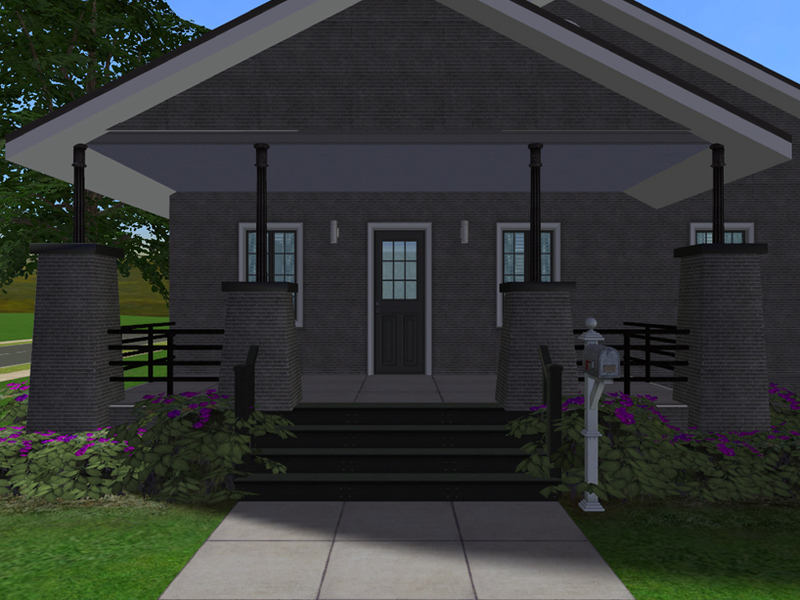 The top part has 9 recolors in shades of white, grey, black and brown. The columns are repositoried. 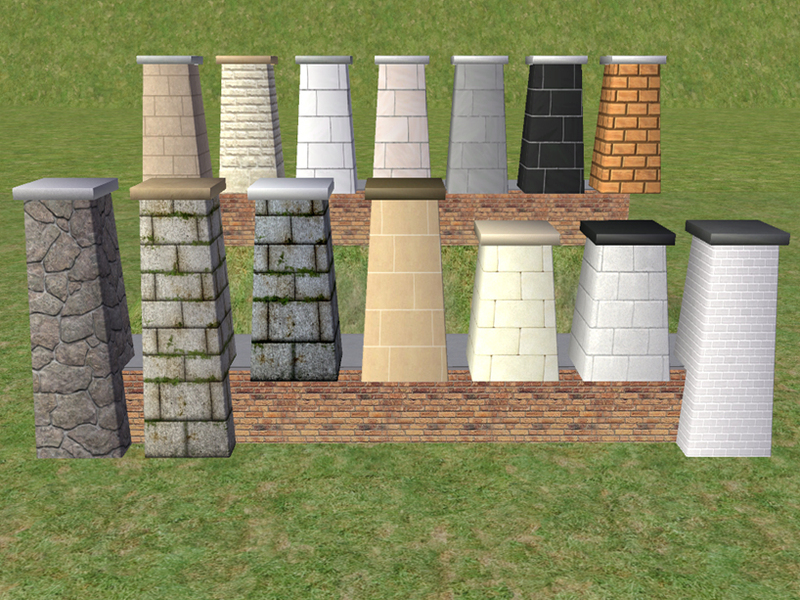 The Flared Column is the MASTER of the set, you need to have this one in your game for the other 3 columns to work. 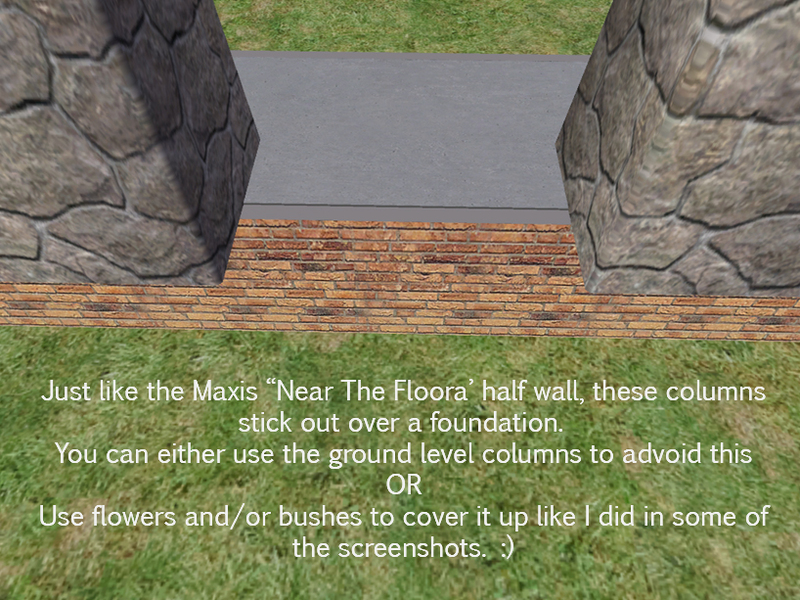 You will need to use moveobjects on to place the columns on the ground if you're using them next to a foundation. 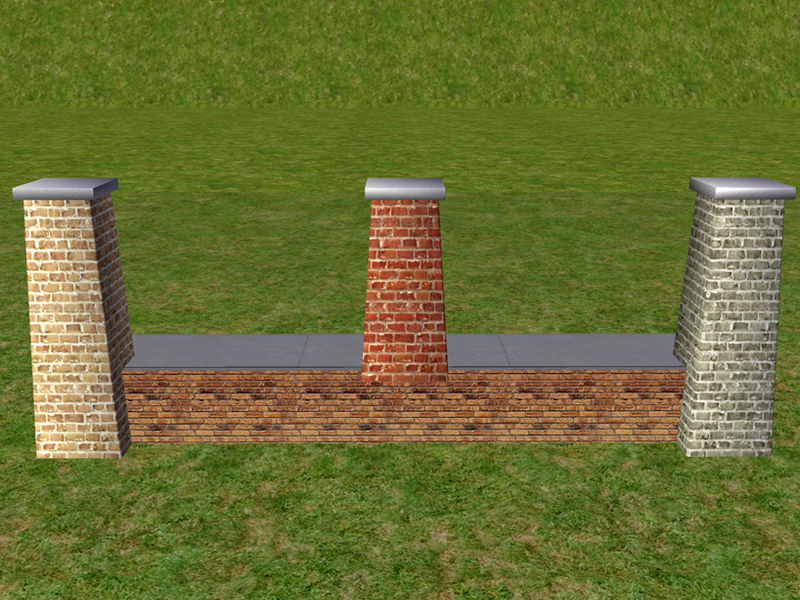 If placing them on a foundation or placing another column in/on/over them, no cheats are needed. These columns are meant to work and look like the posts from the Maxis half wall - so they are positioned in the CORNER of the footprint. If you want to place them so that they sit right on a foundation, you will need to use boolprop snapobjectstogrid false or setquartertileplacement on to do so. Since these columns don't have any posts going up to the next floor level any roof you use over them will look like it's floating in mid-air. If you like this look, fine! If not, just stick another column in/on/over them to give that roof some support! 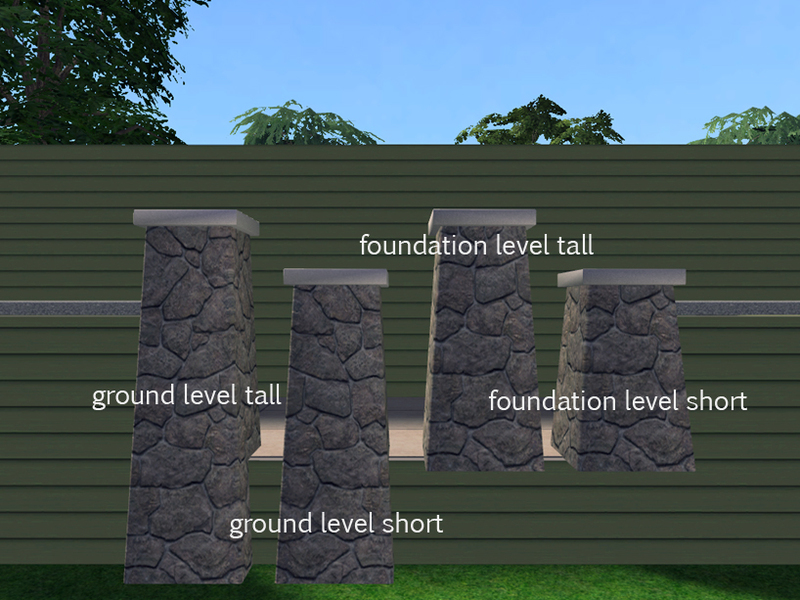 As shown in the screenshot, these columns WILL stick out over a foundation. 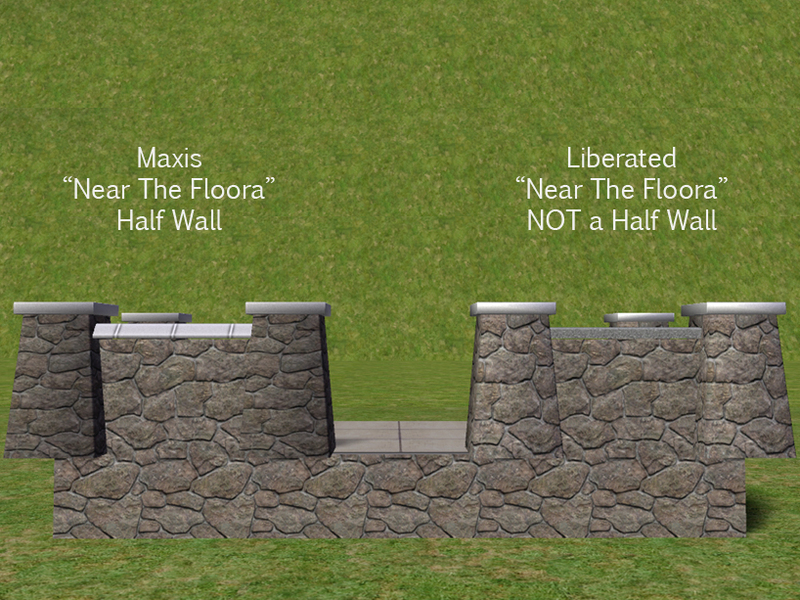 The Maxis half wall does the same thing. 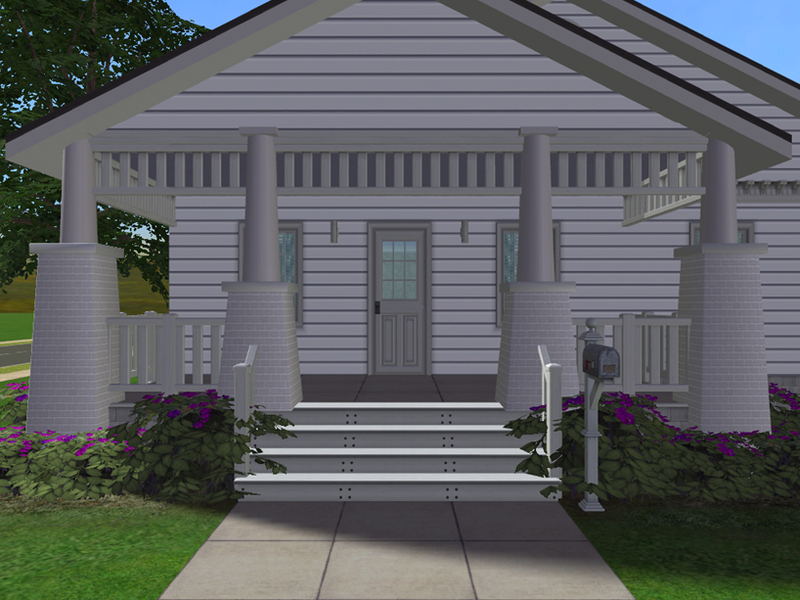 If you don't like the look of that, use the ground level columns OR use flowers, bushes or shrubs to cover it up. If you place a column and it's dark, rotating it should fix that problem. 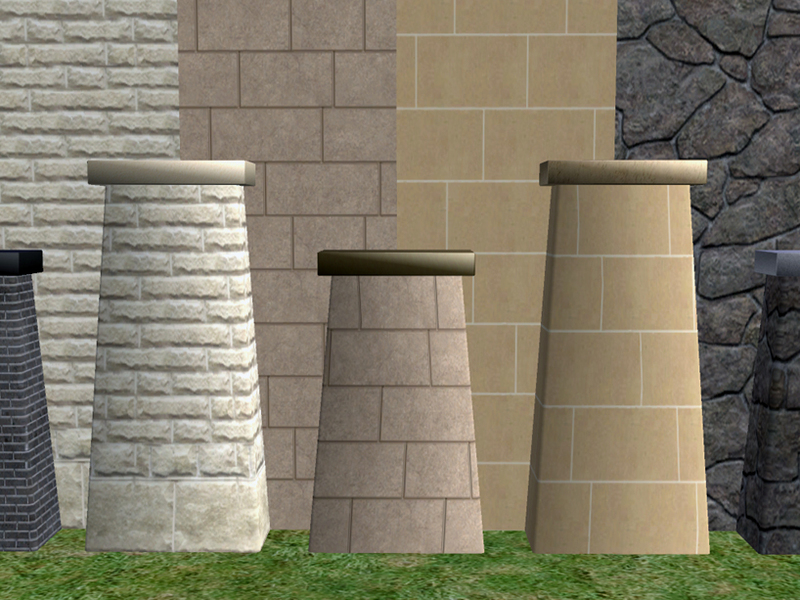 The screenshots show different uses for these columns. 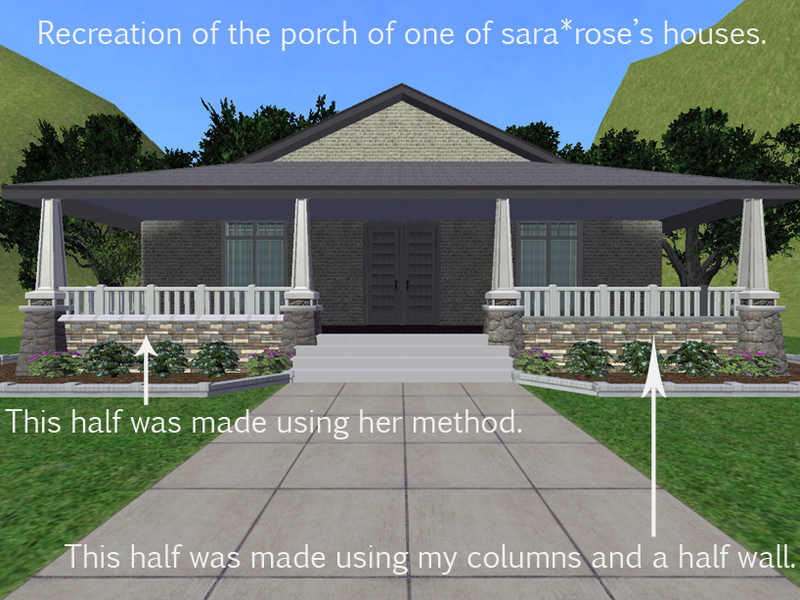 I even recreated one of sara*rose's houses (the porch part at least, lol) to show you that you can use them just like she used the Maxis half wall. One half of the porch was made using the Maxis half wall, the other using my columns and a half wall I have in my downloads. 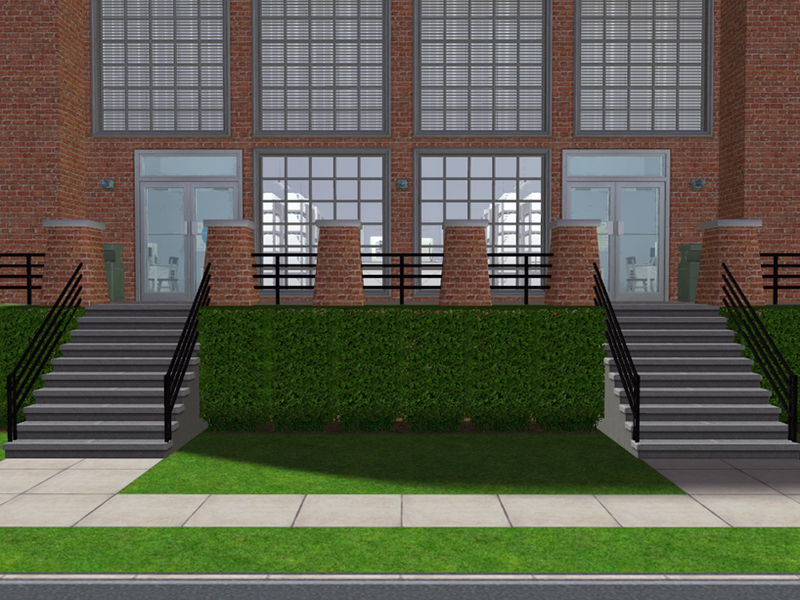 There are more ways to use these than I've shown, so have fun building with them!! If you'd like to recolor, it's super easy. All you need to do is extract a wallpaper that you like for the main part of the column. 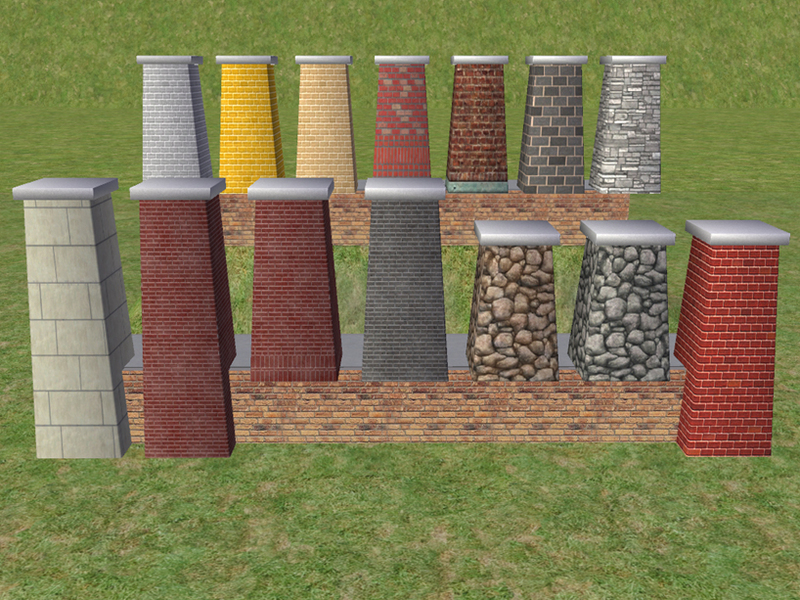 The top part is super easy too, all you need is a simple texture for it - and if you'd like to use a patterned stone or brick for the top part, it's mapped so that it will match the main part of the column. Basegame compatible. There is a collection file included - the matching wallpapers were added to it so you won't have to hunt for them in game. 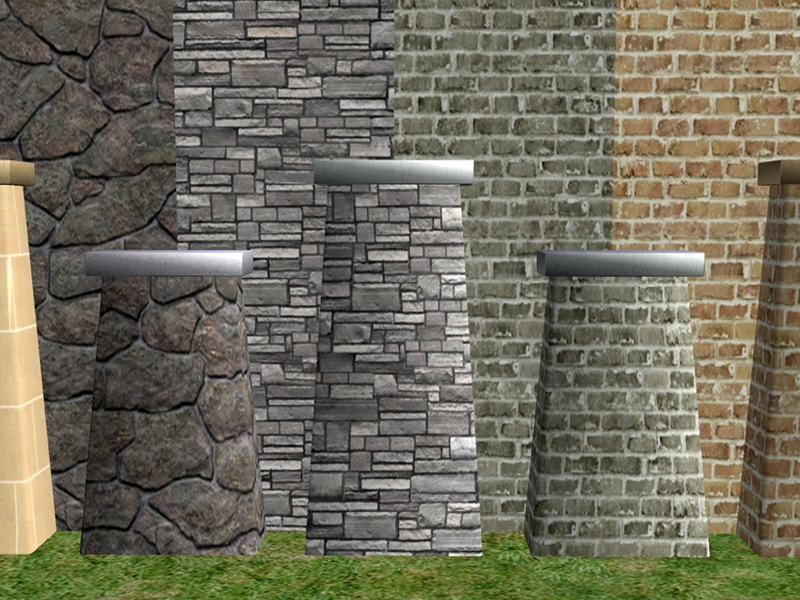 Since the textures were extracted from the game files there were a few that do NOT exist in game (silly Maxis), so there are a few columns that don't have a matching wallpaper. MLC-CraftsmanColumns2017.rar | Description: All meshes and recolors.